Reluctant to strike your audience as dull or mundane with your presentation? Tired of the dry PowerPoint consisting of words and texts only? If so, you are highly suggested to put more efforts to make your presentation intriguing. Rather than rack your brain on various presentation settings, to embed YouTube video in PowerPoint can easily spruce up your presentation and make it elegant and dynamic. But how to add a YouTube video in PowerPoint to make your presentation a far more engaging experience? Take it easy, here we will show you how to insert YouTube video into PowerPoint easily. How to insert a YouTube video into PowerPoint? The ways to insert YouTube videos into PowerPoint can be split into two categories: you can either add YouTube into PowerPoint after downloading the YouTube videos with a proper YouTube downloader, or directly link the YouTube video in the slide. Which one to choose will depend on your internet connection. However, unless you want to take the risk of getting stuck in the middle of a meeting for the buffering or fail to open the YouTube videos which are deleted by the uploader, you'd better put a YouTube video into PowerPoint after download. Below we are going to discuss this highly recommended option: download YouTube videos and then add YouTube clips in PowerPoint. Before we go to see how to embed a YouTube video in PowerPoint, the very first thing is to have a clear idea of what formats can be used in it. To put it other way, if your video is not in the format list supported by PowerPoint, you will have to convert the video into PowerPoint compatible formats before inserting. PowerPoint 2013 – AVI, MP4, M4V, MOV, MPG, MPEG, SWF, or WMV. PowerPoint 2010 – SWF, AVI, MPG, MPEG, WMV. As most YouTube videos come with the format FLV, which is not in the list supported by PowerPoint, you have to download YouTube videos and convert them into a PPT compatible format like WMV, AVI, MOV etc. For this purpose, an all-in-one YouTube downloader and converter named MacX Video Converter Pro is right here for you. This software can download any YouTube videos, no matter SD videos, HD 720p, 1080p or even 4k Ultra HD 2160p videos, and convert them into PowerPoint video formats like MP4, AVI, MOV, WMV and many more. It enables you to easily embed YouTube video in PowerPoint of any version, including PowerPoint 2003, 2007, 2008, 2010, 2011 or 2013. Also note that in addition to YouTube, this software also helps you to link videos from more than 300 sites in PowerPoint, including Facebook, Dailymotion, Vevo, Vimeo etc. Follow the guide below to make a PowerPoint friendly video first. Step 1: Free download and launch this software to insert YouTube video into PowerPoint. Click "YouTube" button, copy and paste the URL of the YouTube video you want to add to the type box. After you click "OK", the rest video downloading job will be automatically done by this app. Step 2: For the purpose of embedding YouTube video in PowerPoint, choose one of the PowerPoint friendly format like YouTube FLV to AVI, MPEG, WMV as output format. Step 4: Hit the "Start" button and start to download YouTube video to PowerPoint on Mac OS X. 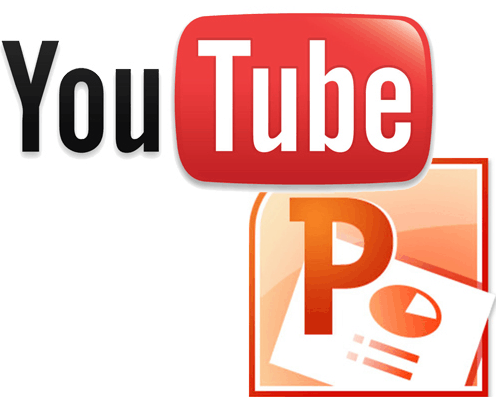 Then you can embed YouTube into PowerPoint in few minutes. After you download and convert YouTube videos into AVI or WMV etc, you can start to insert YouTube video into PowerPoint. Open PowerPoint and select Insert button on the top toolbar. Then go to Movie and choose Movie from File. In the pop-out window, just select the YouTube video you just downloaded and converted. Though the above method is strongly recommended as your safe way to embed a YouTube video in PowerPoint, if you are confident in the internet connection where you are going to show the presentation, you can also choose to put YouTube videos into PowerPoint by adding links. To achieve this, click Insert button on the top and choose Video. Then select Online Video... and choose YouTube. Then you are allowed to search for the YouTube videos you want to add into PowerPoint. This method is the easiest but sound internet access is a must.